How to make me and the dogs happy with some trash? Easy! Just read on! First you should know that our two dogs, Shiloh and Oates, destroy every indestructible dog toy on the market. 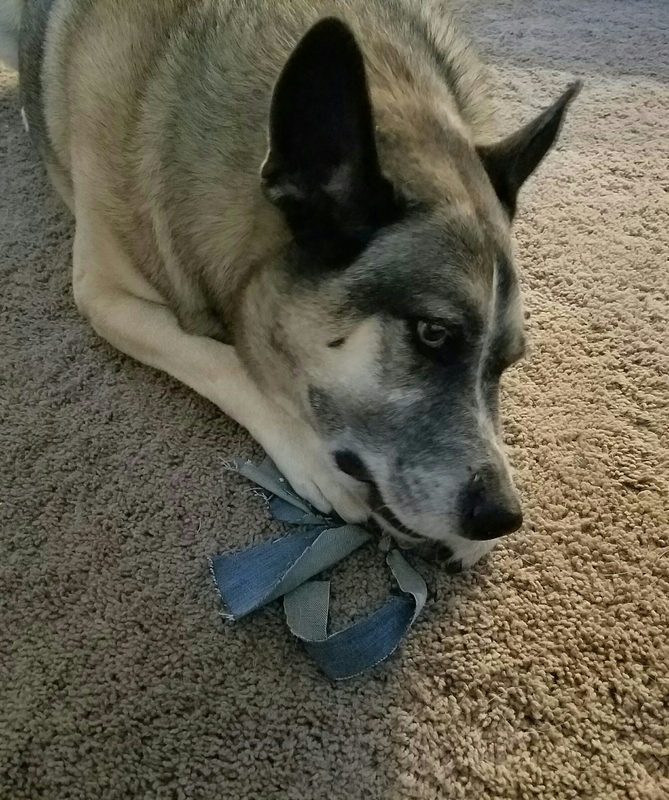 Oates also likes to chew on things that definitely are not toys for dogs as you will see on the pictures (look closely at the scissors…). We spent several dollars on several toys only to pick up the pieces, scattered all around the house, while the dogs sat there grinning mischievously. But not with me, cheri! 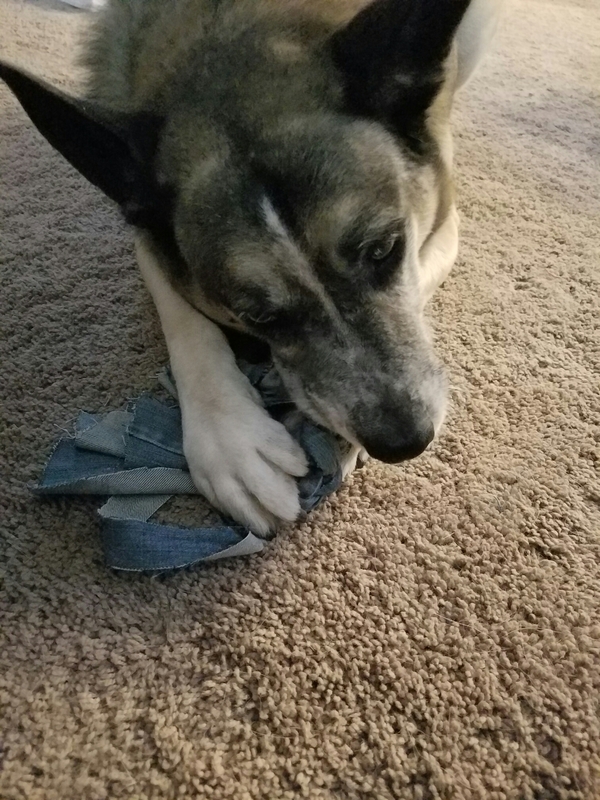 I made them the ultimate super easy tug-of-war dog toy out of the leg of the old jeans and so far it survived. They chew on it, they pull on it from both sides, Oates carries it around in her mouth so the ends hang out, making her look like she has a viking mustache, but it holds! 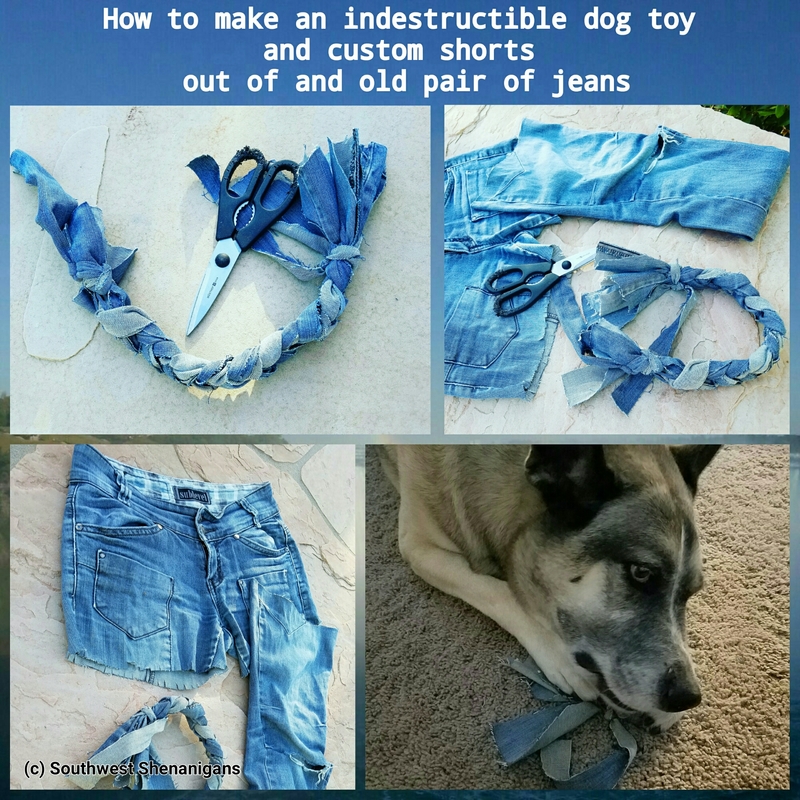 And if it should break, well, the jeans conveniently had two legs so I can make another toy! 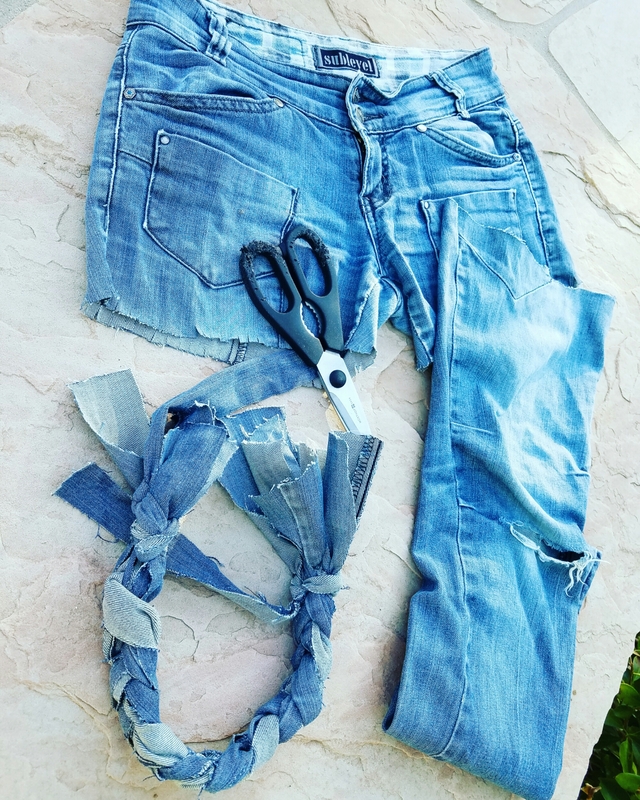 Simply cut off the legs at a length you want – as we will turn the upper part of the jeans into shorts – and cut the leg into eight strands. Tie six of the strands together with one of the remaining two strands (tie a good three to four knots and pull them as tight as possible). Now make a simple braid, and tie tight with the last strand, again knotting it as tight as you can. Of course you can do the same with the other leg right away, or make an extra thick braid with strands from both legs. Now to the shorts. Don’t worry, you won’t need a sewing machine or any experience in fashion design. 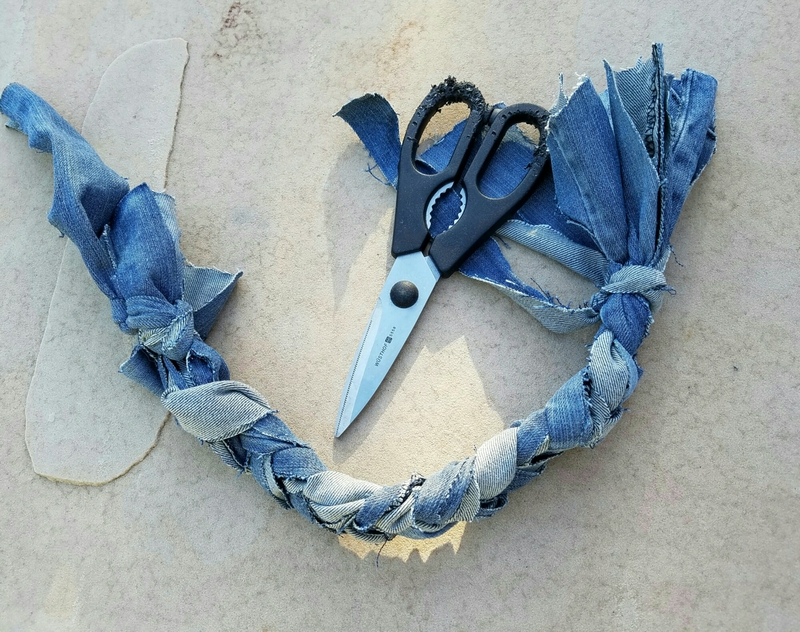 The shorts you got from cutting off the legs of the jeans are almost the final product. All you need to do now is trying to cut the short legs to one length, then you can cut the seam into small fringes (like I did), or fold the seam upwards twice. Both will mask an unevenly cut seam by the way. And there you have two brand new things out of one old pair of jeans! Shiloh did his best to shred it to pieces but…. … so far of no avail!